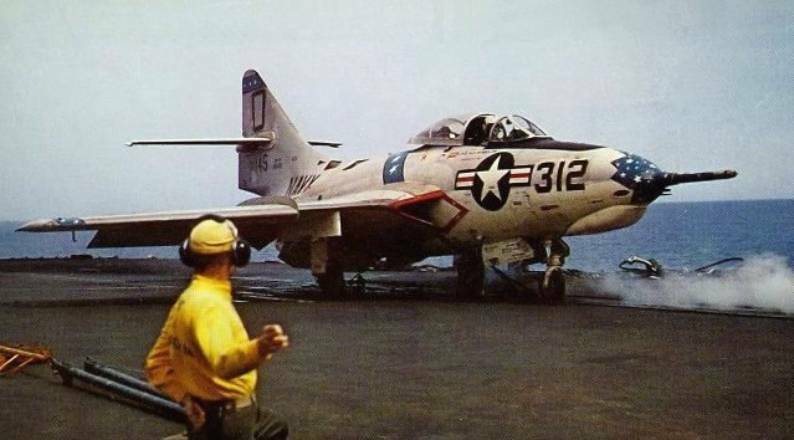 Nov–Dec 1956: The squadron operated from USS Forrestal (CVA-59) off the coast of the Azores during the Suez Crisis, awaiting a call to enter the Mediterranean if necessary. 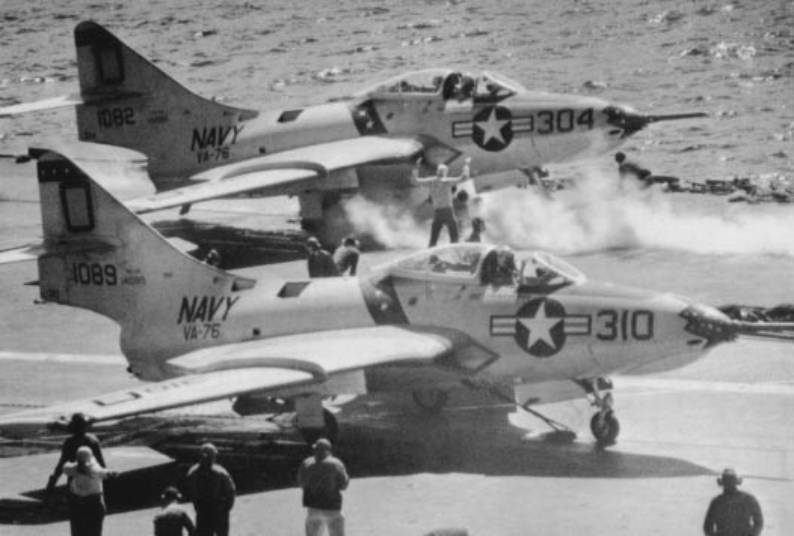 Jun 1961: The squadron deployed aboard USS Intrepid (CVA-11) and operated in the Caribbean during the crisis in the Dominican Republic that followed the assassination of dictator Rafael Trujillo. 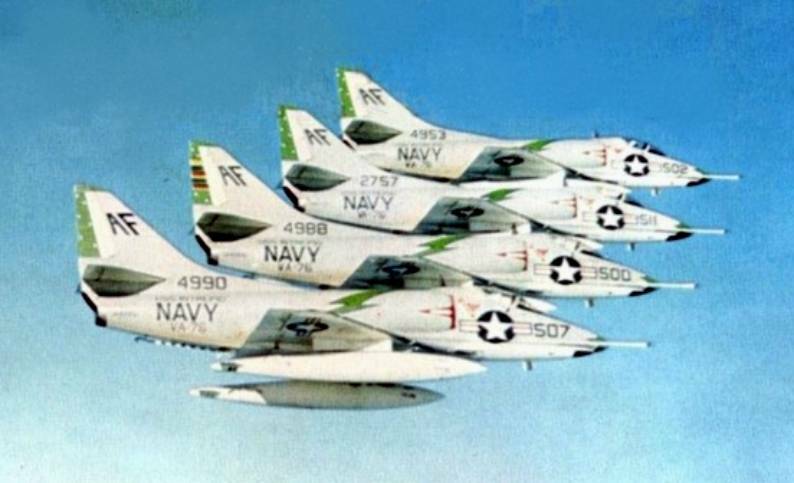 19 Oct–08 Dec 1962: The squadron deployed aboard USS Enterprise (CVAN-65) and operated in the Caribbean during the Cuban missile crisis and naval blockade. Mar 1964: Conducted operations in the vicinity of Cyprus during a conflict in that country between Turkish and Greek Cypriots. 31 Jul–3 Oct 1964: While embarked in Enterprise, the squadron participated in Operation Sea Orbit, the first circumnavigation of the world by a nuclear task force. The sixty-five day voyage was accomplished without replenishment. 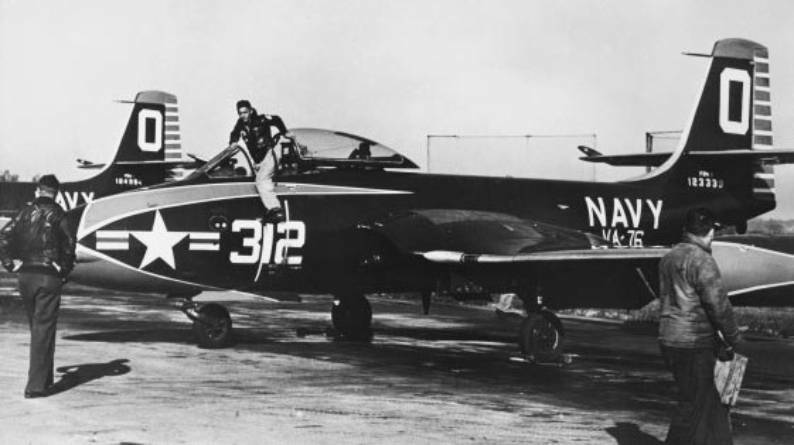 The squadron participated in numerous air power demonstrations during the voyage. 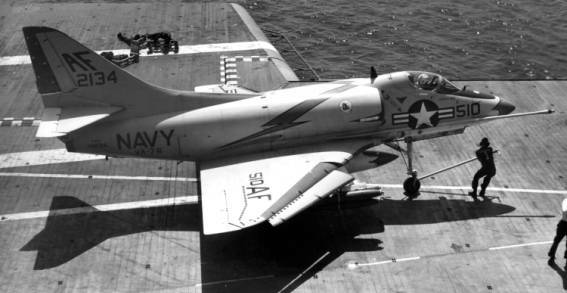 8–25 Feb 1965: A detachment of the squadron’s A- 4C Skyhawks, configured with Sidewinder missiles, was embarked in USS Essex (CVS-9) for an Atlantic Fleet exercise. 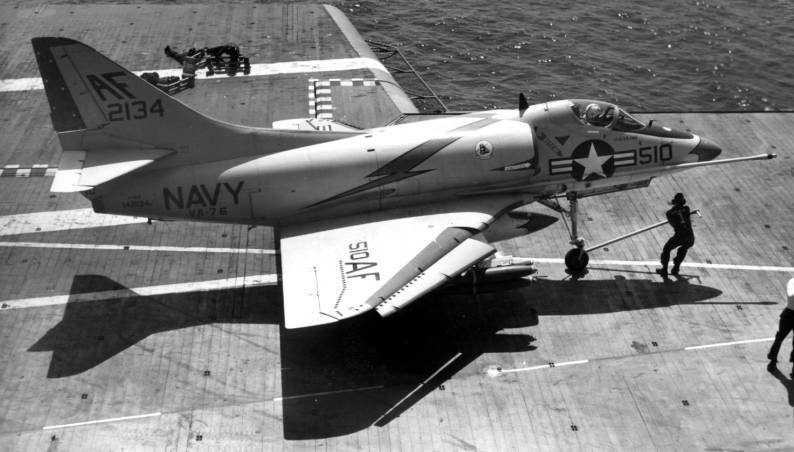 The aircraft were used for limited daylight fighter protection for embarked ASW aircraft. 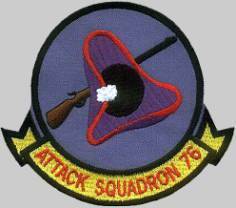 29 May–15 Jun 1965: While temporarily based ashore at Naval Station Roosevelt Roads, Puerto Rico, the squadron flew armed reconnaissance sorties over the Dominican Republic during a crisis in that country. 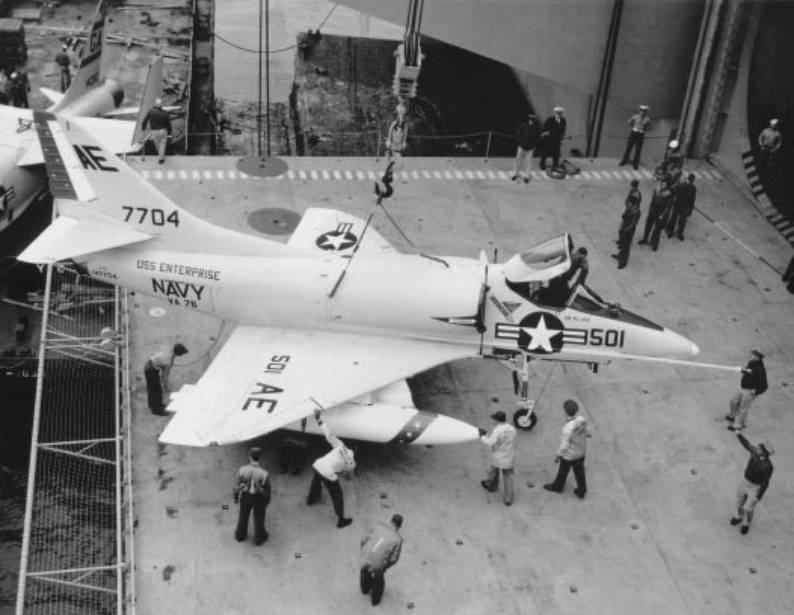 11 May 1966: The squadron’s commanding officer, Commander J. B. Linder, was awarded the Silver Star for leading the squadron on a strike against a mobile SAM site at Thanh Hoa, North Vietnam. 6 Dec 1966: The squadron’s commanding officer, Commander A. D. McFall, was killed when his aircraft crashed following a night launch from USS Bon Homme Richard (CVA-31). 1 May 1967: During a sortie against North Vietnam’s MiG airfield at Kép, Lieutenant Commander Theodore R. Swartz shot down a MiG-17 with air-to-ground rockets. 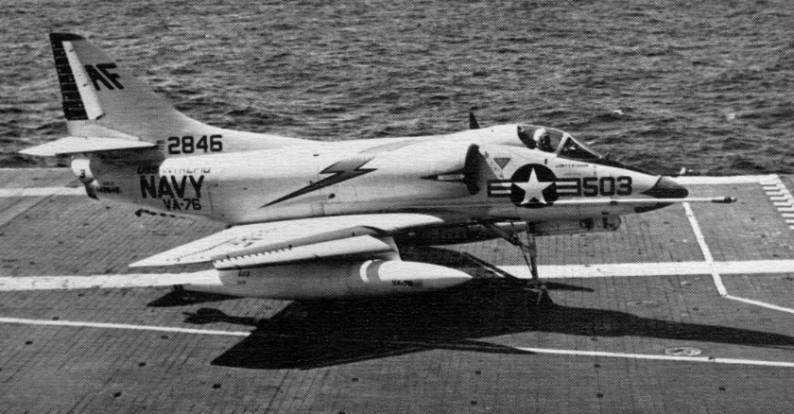 This was the first, and only, MiG aircraft to be downed by an A-4 Skyhawk during the Vietnam conflict. Lieutenant Commander Swartz received the Silver Star for his action. 14 Jul 1967: The squadron’s commanding officer, Commander R. B. Fuller, was shot down during a sortie over North Vietnam. He was released from captivity on 4 March 1973 following the 27 January 1973 ceasefire agreement with North Vietnam.